On the day 18.10.2012 of the Decade Gala Polish Association of Development, has handed out the prizes within I edition of the “Housing Contest”, organized by PZFD. Housing Contest has collected many investments from Poland, which has competed for a title The Best Polish Developer Project realised in 2008 – 2011. The Contest aimed to select the most resident–friendly, pro-ecological investment with interesting architecture. PZFD - Polish Association of Developers is a nationwide organization of a group of over a hundred developers in Poland.PZFD mission is to promote the development of the Polish residential market and promote the right of every family to own home, as an essential good. Therefore PZFD is trying to build partnerships with developers market. The organization ensures the safety and professional conduct of the process of buying an apartment, is also the author of the Code of Best Practices in Customer - Developer relations. 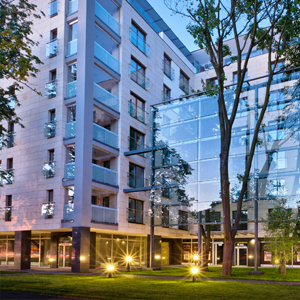 An elegant, modern, 8-story building in close proximity to the Warsaw city center; in the immediate neighborhood of the 18th Century park and historic Królikarnia Palace. 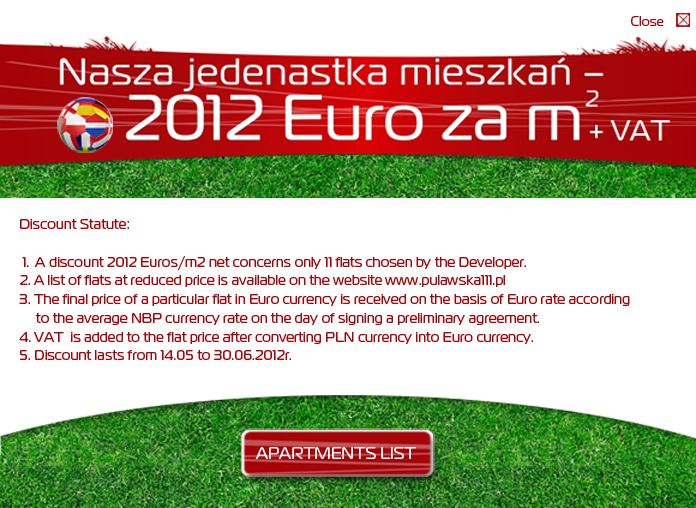 If you are searching for good investment near downtown Warsaw better location is hard to find. It has good connections with other districts and is surrounded by parks, green squares. It lies in the vicinity of historical architecture. The apartment house was designed by renowned architectural workshop “Kazimierski i Ryba”. The building incorporates most modern architectural and technological solutions that harmonize with traditional architecture of Mokotów tenement houses. The building has 7 stories, 120 apartments, and a 2-story underground car park. Modern design of the building was prepared by a renowned architectural workshop “Kazimierski i Ryba”. Exquisite finish of the building corridors and a representative lobby along with the reception make up the showcase of the Apartment House. The projects of the shared spaces were created by an attentive Interior Design Architect Ms. Aleksandra Heymans. Their décor and interesting arrangement of rooms guarantee their users comfort and esthetics. In order to confirm that Puławska 111 Apartments are a special offer European standard services are available – a concierge is at all the residents disposal. Twenty-four-hour security, internal monitoring and individual communication systems in the form of a video intercom watch effectively over the safety of the dwellers. Spacious and comfortable apartments in the building at Puławska 111 are an offer that meets even the most demanding client’s expectations. The residence is furnished with air conditioning and smart home systems, which enable users to manage the heating of the apartments, lighting, roller blinds and simulated presence program. Panoramic wooden windows emphasize over standard height of rooms (up to 2.9 meter) and add unique charm. Apartments are also equipped with broadband internet connections, a custom TV system and telecommunication installation. In cooperation with Galerie Venis showrooms we have prepared for you a special offer as for turnkey interior décor. Having in mind future owners of Puławska 111 Apartments, we have created a design detail catalogue. It was accomplished with the help of specialized architects. You may decide about particular solutions and products for the décor from the catalogue, and the designers will see to room arrangement and realization of your request, all according to your expectations. Within the confines of the turnkey program one may select between the two décor packages: Bronze and Silver. They offer different materials and products, but first and foremost guarantee high quality and uniqueness. The catalogue includes the materials of the brands such as Baldocer, Halcon, Venis, Noken that belongs to Porcelanosa Grupo, Koło, System Pool, Porta Drzwi, Klimek and Kluś, Balterio and Finishparkiet, Tikkurila and Beckers. Puławska 111 in the heart of Stary Mokotów is an excellent transport junction. Not only is it close to the subway stations (Metro Racławicka and Metro Wierzbno), but also to bus and tram stops, theatres, cinemas, restaurants, banks, stores, schools and kindergartens. An unparalleled trump card of the place is its surroundings – plenty of parks (picturesque Arkadia Park), green squares, recreational areas (Warszawianka Water Park with its Olympic swimming pool and squash courts), as well as proximity to the 18th Century Królikarnia Palace. The apartment house was put to use in July 2011. It is ready to take up residence.